Did you know Dr. Seuss’ birthday is on March 2? We are big lovers of Dr. Seuss at our house. One of our favorite Dr. Seuss books is The Lorax which inspired me to share this fun and simple Truffula Trees craft with you. You may also like this Ultimate List of Dr. Seuss Activities, Crafts & More. You could also read ‘The Lorax’ with your kids and make this truffula trees craft as an Earth Day activity on April 22. Of course, if you’re family loves Dr. Seuss like mine, this is a fun Dr. Seuss craft for anytime. You might also like this Cat in the Hat kid craft. 1. Paint each craft stick yellow and let dry. 2. 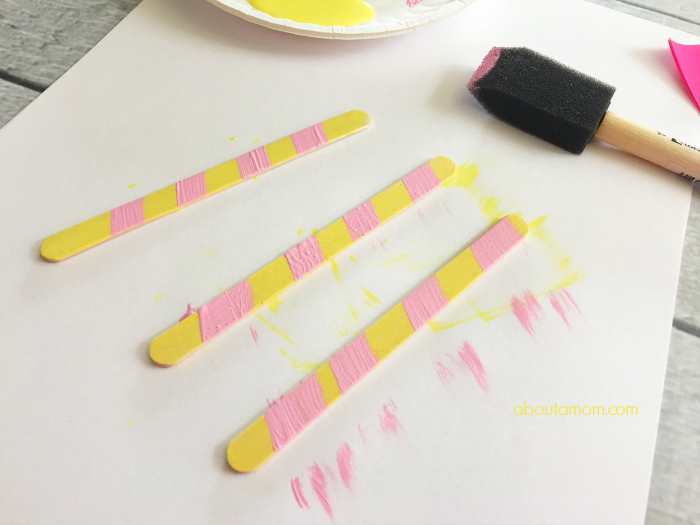 Then paint pink stripes onto your yellow sticks an an angle and let dry. 3. Cut the inside circle of your paper plates out. 4. This next part is best done by a grown up. There me be a craft glue out there that will do the trick, but if not use your hot glue gun. 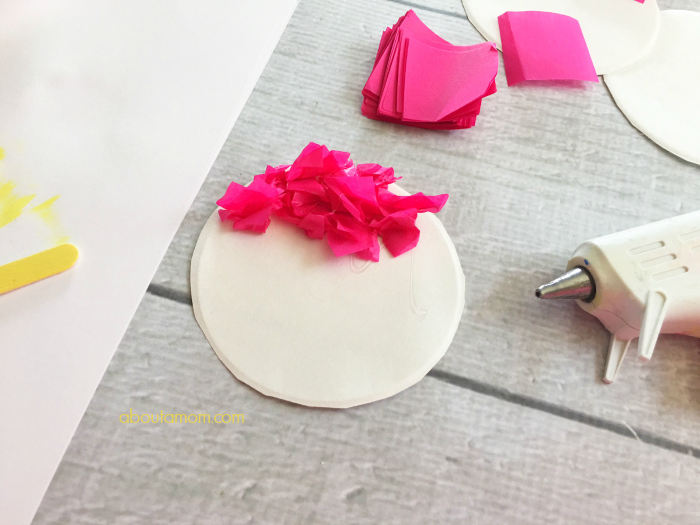 Squirt a small amount of hot glue onto your plate circle, lightly crumble your tissue paper squares, and carefully press onto the hot glue. Continue until each plate is filled up with a different color. 5. 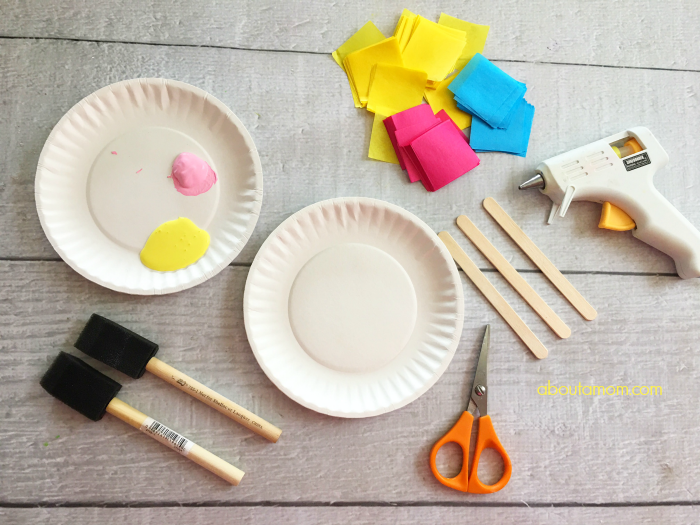 Carefully hot glue your painted craft stick onto the bottom back of your tissue paper filled plates. Also check out 50 Fun Things for Kids to Ask Alexa! We so love Dr. Seuss in our house and this would be a fun craft project to do. We enjoy Dr. Seuss books. What a fun craft idea this is! I love this cute Craft item to make with the kids. I think your Truffula lorax turned out great. These are so darn cute! And kids would love to make them, along with a little help from someone whose fingers are more nimble like Mom or Dad or fav auntie! These are so colorful and looks like a really fun craft! I like how simple and yet how colorful these are. These would make a good kid’s craft with different colors and items for them to use their imagination and creativity. The Lorax is one of our favorite movies. This is really adorable and simple enough I could even do it! This is such a cute and creative way to express yourself with Dr Seuss, I am so looking forwrd to making some of these with the children. These TRUFFULA TREES are such a cute, colorful and fun idea. My niece would enjoy making them.